MOJO magazine celebrates the 50th Anniversary of The Who, and their 2015 summer of live, with a 22-page exploration of the band’s 50 Greatest Songs. 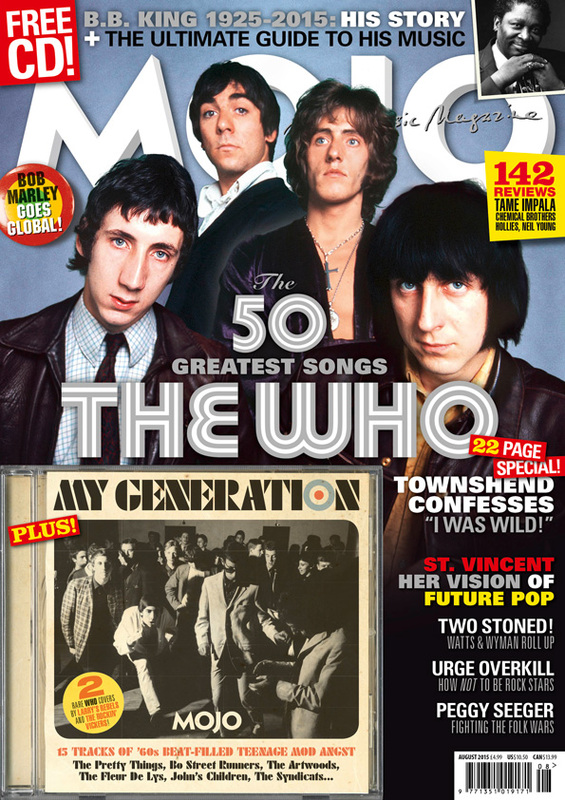 Meanwhile, mainman Pete Townshend submits to a revealing MOJO inquisition while our free covermount CD – My Generation – taps into The Who’s ’60s era with mardy Mod action by The Pretty Things, Artwoods, John’s Children and more. Also in this month’s magazine: St. Vincent, Charlie Watts, Urge Overkill, Bob Marley, Peggy Seeger, and the ultimate guide to the music of the late, great B.B. King. Plus! 142 reviews, starring the stunning new album by Tame Impala. Who’s best? Do we even need to ask? The Who The group’s 50 Greatest Songs, tributes by Johnny Marr, Wilko Johnson and Geddy Lee, plus an audience with Pete Townshend as we present a 22-page celebration of modernist genius. B.B. King His story and the ultimate guide to his music. Charlie Watts The Rolling Stones sharp-suited timekeeper on jazz, clothes, Soho, hipness, fitness and more. St. Vincent Startling, baffling, scary, inspiring, radical, unique. Pop polymath Annie Clark is all this and more, as MOJO discovers. Peggy Seeger We celebrate the 80th birthday of the woman who transformed US and UK folk on her terms with a nice spot of tea. Urge Overkill The Quentin Tarantino-approved alternative rock lords emerge from a dark funhouse of heavy drugs. REVIEWED NEW ALBUMS… Tame Impala / A$SAP Rocky / Desaparecidos / Sleaford Mods / Sun Kil Moon / The Chemical Brothers / Pete Townshend / Lianne La Havas / LA Priest / Richard Thomspon / Sarah Cracknell / Major Lazer REISSUES… The Strands / Thelonious Monk / Lloyd Cole And The Commotions / Miles Davis / British Sea Power / George Clinton. Plus! The return of The Libertines: the band discuss their much delayed third album / Vic & Bob’s self-portrait has to be seen to be believed / In the studio with John Lydon / Bill Wyman dodges doodlebugs / On the road with Hot Chip / B.B. King remembered… and much more!